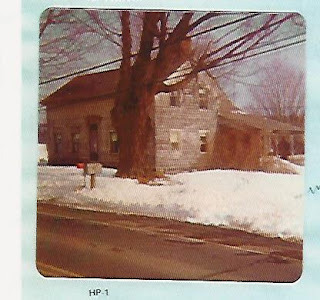 In 1981, the Washington County, NY, Information, Tourism and Historic Preservation people documented every 'old house' in the county they could. This is the picture which accompanied the form, and the only picture known showing anything of the rest of the house. The land was part of lot #12 of the Grand Division of Cambridge Patent. The town of Jackson, where this house is, split off from Cambridge in 1814. The Parrish family owned the farm from 1846 until 1929 when Charles T. Hayes bought the farm. His son, Charles J. Hayes was the source for those gathering information. Who added the left wing to this house around 1820? Who wanted stylish design - the Federal front door and moldings - and technological improvements - the cast iron wood stove in the north room? Usually a new owner, a new wife, better finances, will mean new construction. Here there is no easy answer. Before the Parrishes, several families owned this land. However, from 1796 to 1839, Garrit Wendell, a well-respected lawyer and leading citizen of Cambridge, the town next door, was the owner. Wendell was born in Watervliet, NY, in 1769. He married Rebekah of Dutch descent; they had 2 children. He died in 1840; his wife in 1843. I found no record that he ever lived in Jackson. Wendell may have leased this house to William Mushet who is mentioned in a deed. Mushet was not wealthy; he contributed $6 to help build the Washington Academy in 1814, while Wendell's subscription was $500. Why would Wendell renovate and update this farm? I have not found an answer. The frame is 'Dutch'; it is made up of a series of bents, here 12, approximately 3 ft apart, for the 36 ft. length. This implies that the framer had been trained in the local Dutch vernacular tradition as practiced in upper Hudson River valley. The last bent on the left side has been removed by the timber framers in this picture. 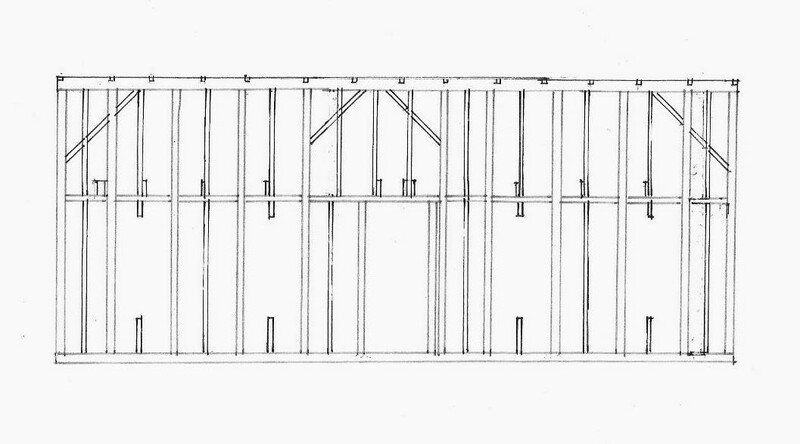 An 'English' frame would have had 4 bents: one at each end, one on either side of the center door and its hall. Mixing framing traditions is not uncommon in this part of eastern New York and western New England. Here the frame is Dutch and the exterior appearance, Federal., based on English architecture. The south end of the frame shows the braces set just below the gable end rafters. These were on both ends of the wing. The original house had also braced this new wing. Green Mountain Timber Framers who were deconstructing the house felt the frame move and secured it with cross bracing, visible here. 3"x 8" joists are mortised through the posts and pegged at the second floor height. A 3" x 6" rim joist is then attached below the joist and pegged. The next bent can now be slid into place because its mortise is ready to receive the rim joist. 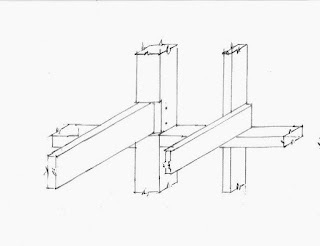 Its floor joist can be slid into place because the easing on the 6"x 6" post runs across the face of the post, not just at the mortise. Then the intermediate stud is set below and above the rim joist and a 2"x 8" joist nailed to it. Some of the joists are notched to make the 2nd floor level. Here is another set of post and joists. 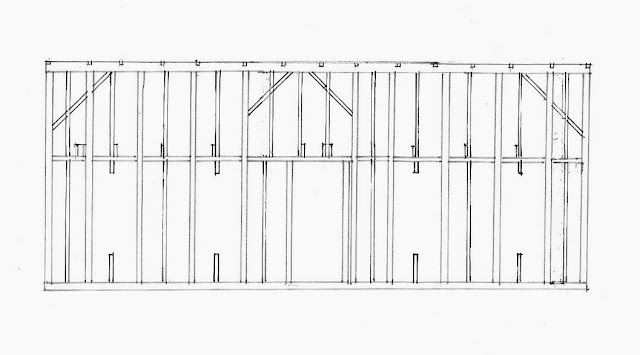 The setting of the secondary joists - about half on the left side, the rest on the right - might be because the framers worked from each end of the wing toward the front door. The parts for these bents might have been cut ahead of time and assembled on site. They are quite uniform. Here is a look along the 2nd floor joists on the east side, Reused posts are visible. 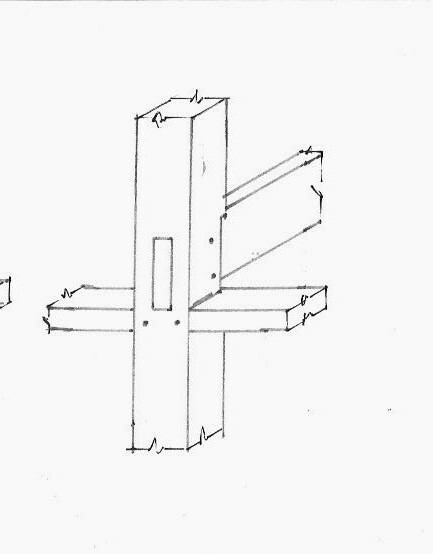 The south sill was also a reused timber, a plate with notches for rafters and the necessary holes for pegs. The door frame is not neat. There is some fudging - an extra post to set the door in the center, Framing for the stair opening seems to have been figured out on the job. Similarly the extra 2 joists, one 6"x 8", the other 2"x 8", which carry the chimney above the stove pipe seems to intrude into the rhythm of the frame a decision made on the spot. 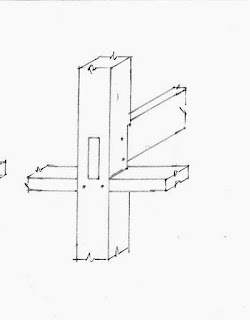 The framing of the gable ends includes both mortised and nailed joints. 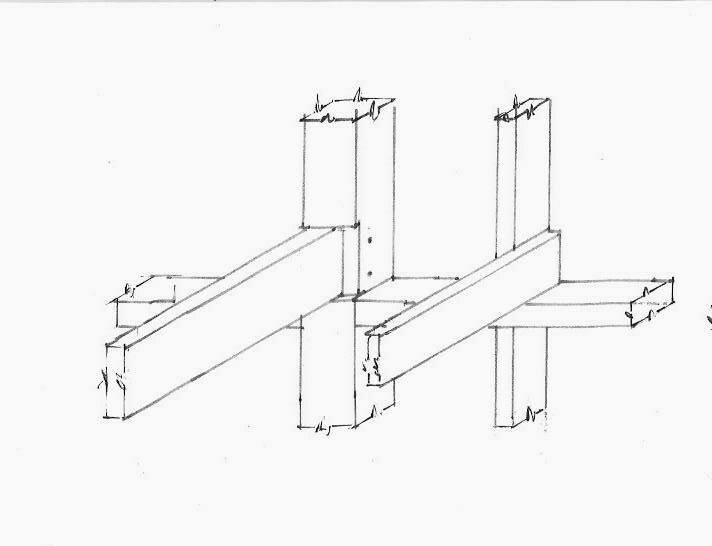 Mortise and tendon framing does not need nails. We used it extensively as a framing system before 1800 partly because nails were hand made from scarce iron ore not easily processed. The invention in the early 1800's of nail making machines changed how we framed. Here, c. 1820, both wood pegs and iron nails are used to hold the wood together. This is a transitional frame. Here are details at the gable and at the 2nd floor. The left photograph shows the nailed north gable on the ground after it was taken down. The right photograph is the braces mortised into the 2nd floor beam. Here is the plate, with its unusual bird's mouth - the mortise which holds the rafters. I and the framers, and others who know historic framing in the Hudson River Valley, had never seen this joint before. The plate is mortised to the posts. Notice on the framing layout that the rafters do not line up with the posts. This means the walls and the roof were thought of as separate entities.